So after resigning from FC Zwolle following relegation, I was out of work for about six days. We, for game date relatively, were in line with the beginning of Michel’s career. In 1960, Michels began at JOS. JOS, based in Amsterdam are now an amateur club and were not in the game as a playable team. However, within days of my Zwolle resignation, the job became available at Almere City. 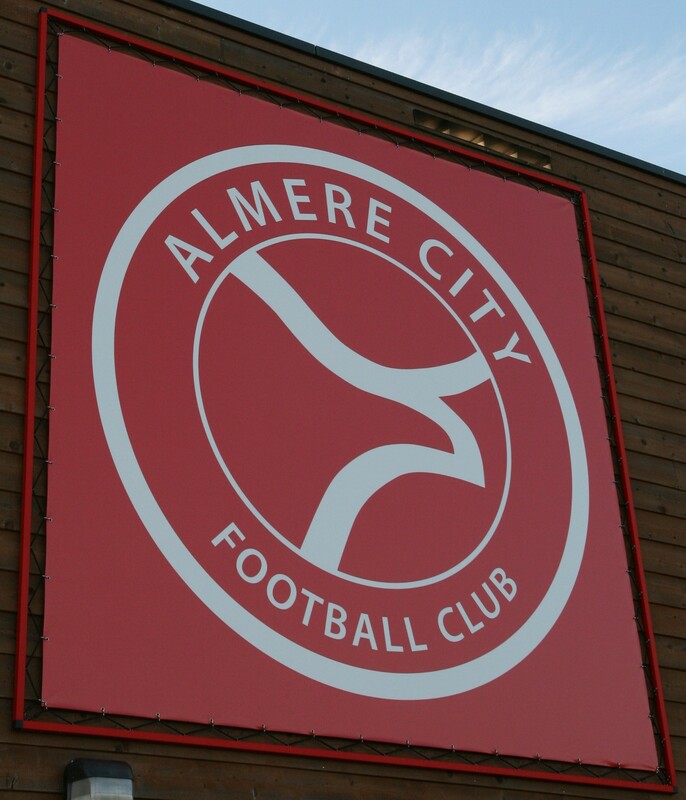 Almere, had in the game despite being predicted to struggle reached the play-offs both times. Almere is a short ferry ride from Amsterdam and it was a relatively small club but with potential. I took the job, to the ire of my former employers and bought Jaap Stam with me as my assistant. The 2–3–2–3 formation had worked for me rather well in the Eerste Division in 2010–11. As such I kept them for 2012–13. 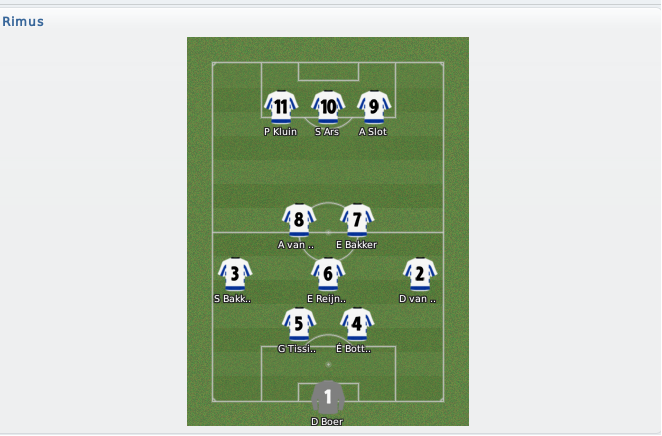 The formation would work well for Almere perhaps more naturally than it did for Zwolle. I made several loan signings early on. First in was Felix Kroos, younger brother of Toni from Werder Bremen. Kroos was to have a scintillating start, scoring four in his first five, before spending the rest of the season as more of a creative force than a goalscorer. With his Bremen contract expiring in June, I offered him a pre-contract in January, though he wasn’t interested. In April, however, he finally agreed to a two year permanent contract. Haris Seferovic, Fiorentina’s Swiss under-21 international was next through the door. Seferovic would have the opposite season to Kroos, initially starting as a creative playmaker in the Cruyff role, Seferovic would start scoring like there was no tomorrow. He would score 32 in 41 games in all competitions as well as being named Player of The Season for the division. The third striker in came from Simone Zaza of Sampdoria, Zaza would show some good performances but be largely inconsistent and thus was not offered the chance to sign permanently on a bosman. Next up were two former Zwolle men. Youness Mokhtar had not played for PSV since returning from Zwolle. He’d had some good games for the club but lost his place at Zwolle. With more experience, I took a punt on him again. He was horrible, a ghost of his former self. Next in was Joel Veltman. Veltman, 20, had looked poor for Zwolle but this may have came about due to being in a poor defence. In the second tier, he showcased his talents a lot more and whilst he needs to add consistency, we agreed a pre-contract deal for when his Ajax contract expires in June. Hungarian international Balazs Toth came in from a free after his Genk deal expired. An experienced customer, Toth added balls to the centre of the park. Dennis van der Wal, took the short trip over from Zwolle to accompany me for £130,000. van der Wal, 26, had to deal with the competition of Bram van Polen and Jan Kromkamp at Zwolle, but still made significant contributions in both my seasons as manager. After 155 league experiences at his only club, he would become a consistent performer at Almere and added some vital goals to his game. The club’s record transfer was broken to sign Genoa’s Greek midfielder Panagiotis Tachtsidis, who had an impressive season on loan at Nottingham Forest in 2011–12. Despite injuries, the young midfielder would show class and prove to score some important goals. In need of another midfielder, I loaned Le Mans’s 21 year old Chinese youth international Zhang Jianqi. There was an option to make this permanent that was not taken. He was a good option, but just didn’t do it enough. Colombia international Edwin Valencia came in a free from Fluminese. This deal had been agreed under my predecessor, but a lengthy month-long absence meant Valencia made his debut at home to Excelsior the day he signed. He put in a classy performance and scored a 30 yard screamer in a 4–0 win. Both him and Toth would take turns getting injured, but towards the end of the season Toth would play ahead of Valencia and this would create a wall in front of our already strong backline, capable of a pivot to attack. January, saw the arrival of Lorca’s 16 year old Spanish goalkeeper Angel Garcia Garcia, at his young age he had already made over 50 first team appearances and was a popular figure at the club. With Edwin Friebel being on the decline and set to leave in June, Garcia Garcia would spend the season in the reserves before being promoted in 2013–14. Transfers out were a little less control. Velda, Malone, Rijnink and Willmse had already agreed transfers before I joined. Soubervie, El Moussaoui, Juan, Dekkers, Robben and Prins had all performed poorly and were deemed surplus to requirements. Willemsen and Huijsman weren’t expected to be regulars so were allowed to leave without much ceremony. Kees Tol had performed poorly and with a plethora of options was allowed to leave in January for £9,000 as it was our last chance to get cash for him. I wasn’t keen to renew Youssouf Koubali’s deal and due to the form of left-back Bartek Pacuszka was also let go. This allowed young left-back Arno Michels to make the jump to the first team and he performed well in his substitute cameos. We only had two pre-season friendlies. Not many conclusions to draw from these two. Whereas the campaign with Zwolle had seen a quick breathtaking start followed by a meander over the finish line, Almere City’s campaign in 2012–13 had a slow start followed by a sprint finish. Tachtsidis scored a penalty and later an own goal as we dropped points at Telstar in a disjointed performance. Van der Wal was particularly poor but picked himself for the visit from Excelsior. Kroos gave the side a lead, van der Wal also connected with a low cross into the six yard box, Seferovic scored the first of 27 league goals and Valencia’s 30 yarder rounded off the win. After a destruction at Volendam, it was time to welcome Zwolle, my first gmae against them since I left. 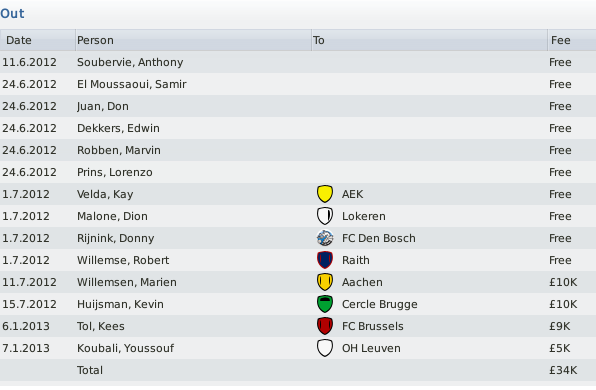 Danny Koevermans had scored two goals in his opening three games, more than the one in seventeen he got for me. The game was even but with one issue — our corner found Lazetic, one of tow Zarko’s on the pitch, alongside Grabovac our captain, he raced through and was fouled by Veltman just outside the box. He headed home the cross from the resultant free-kick. We then went on a strong run before another blip. The end of November began to see the catalyst for the team to shift into gear. 3–0 down at MVV, 16 year old Edwin van Weert became the youngest scorer in the club’s history before Grabovac added another late on. We lost 3–2 but produced another comeback at Excelsior with van Weet and Zaza guiding us to a 2–2 draw. A Seferovic hat-trick, the beginning of his insane run of form saw us win 4–1 at home to Volendam, he assisted the other goal, an own goal from Zarabi. On my return to Zwolle, Seferovic would score within 30 seconds, without Zwolle touching the ball. Jaime Bruinier would score from a corner before Joran Pot would put Zwolle 2–1 up at half-time with a low drive from the D.
Seferovic would add two more before crossing for Kroos to make it 4–2. Tom Van Weert would pull one back but it would finish 4–3 to Almere. After a shock defeat at Eindhoven, the club came back from 2–0 down away at Dordrecht with goals from Renee Troost, who agreed to stay at the club after wanting a big move, Felix Kroos and two penalties from Edwin Valencia gave a vital 4–2 victory. Another Seferovic hat-trick and a van der Wal strike gave a vital 4–0 victory over AGOVV, close title rivals just days later. Van der Wal would score again against Cambuur, while a Zhang double (his first in the league) and another Valencia strike gave another key 4–0 victory. Almere were looking like they would win the league before another blip. Despite Seferovic and Valencia putting the side 2–0 up at home to MVV the Maastricht club came back to win 4–2. With one game left, the side were one point behind Zwolle and facing Sparta Rotterdam, while Zwolle faced FC Den Bosch. The club produced their biggest win of the season. Despite Felix Kroos scoring on his first game after four weeks out with injury and Frank van der Zwan finally scoring his first goal of the season, a 5th minute goal from Lazetic was enough to send the title to Zwolle. 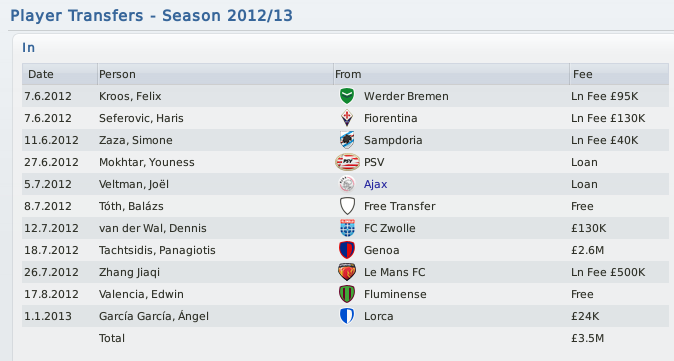 I was regretting signing the Serb for Zwolle. Almere did still finsih second, the side’s highest ever league finish and reached the paly-offs. Strikes from Zhang were enough to help us knock out Emmen and Eredivisie de Graafschap. We made the fourth round, the same round I had been knocked out in both of my seasons with Zwolle. Despite Nicolas Pedersen’s strikes, two second half strikes from guess who? Seferovic, who would be impossible to grasp from Fiorentina sent us to RKC, the ground where my Zwolle tenure ended. Serge Mbila who scored a hat-trick when the Waalwijk side beat Zwolle 5–0 gave RKC the lead in first half stoppage time. Despite having more of the chances, a Seferovic equaliser was followed by a stoppage time penalty from Valencia. An injury depleted FC Twente side met us in the semi-finals. The injuries seem to help us as Seferovic gave us the lead before an Alessandro leveler moments later. Despite misses from Seferovic and Valencia, the side managed to hold their nerve winning the shootout in front of 30,835 fans. The side deserved their win. The final against Vitesse, aka Chelsea reserves, was at De Kuip in Rotterdam, three days after the demolition of Sparta and it was another demolition, the side who finished 6th in the Eredivisie, just weren’t in it. Grabovac had returned in time to start whilst Voorjans had shaken of two serious knocks to make the bench, Zaza was the one player out. van Weert scored with our first chance, Valencia and Tachtsidis scored with tow absolute bangers, Veltman’s header made it 4–0 after a quiet second half, and no Almere City would be finished without a Seferovic goal. Almere City won their first major trophy and I found my name (well,Rinus Michels’s) under favoured personnel. The season was not over there with play-offs set to come. The club picked up where they left off with the KNVB Cup. We easily took apart Go Ahead with van der Zwaan scoring in both legs. The first leg at home to Willem II was tight but van der Wal and Seferovic scored after an early scare. In the second leg, we found ourselves 2–0 down in 20 minutes, before 2 goals in the last ten minutes put us 5–0 down. Van der Zwaan pulled one back. He had begun to show the form that made him top scorer for the club in 2011–12. This was looking a repeat of the RKC play-off from last year. But in another nervy game in Tilburg, Seferovic fired home an equaliser shortly after we went behind. On the hour mark, Yassine Halim, got the winner. Halim had been in impressive form in 2011–12 with nine goals in 18 games. He’d struggled this term. Seferovic and Kroos were undroppable and the only other striker position was the poacher role, which did not suit him. We don’t pay with traditional wingers either, but he got what he deserved for his hard work. The most enjoyable of my three seasons so far. Promotion and a cup win. This season saw the system work best as it made the most of all the players in the line-up, it meant we tired teams out and constantly looked like we could score. Our back-line was a lot tighter too. Next season will be tricky, with more games due to the Europa League. I will need to replace Seferovic of course and the system was hard to implement in the Erevidisie in 2011–12, so what happens now? I was offered the job at Sevilla, which I turned down, the fact that after a relegation, my reputation has increased gives some promise. It will be in an interesting window and pre-season, and I’m certain Almere City would be involved in a relegation dogfight. But time and time again this season, the side dug deep and picked up points, so who knows?